We know that it can be depressing to look down at your toes and see nails that are yellowed, distorted, and unsightly. Fortunately, a little knowledge and understanding can go a long way to ensuring that you receive the treatment you need and take the proper steps to avoid the condition in the first place. To help you with this, our doctors here at Dallas Podiatry Works have written a book— The End of Your Ugly Toenails: A Guide to Understanding Fungal Nails—that we offer to you at absolutely no charge. Toenail fungus is a common condition that affects the appearance and texture of the nail tissue. Mild cases might not bring additional issues besides the embarrassment and self-consciousness you may experience. More severe cases, though, can lead to separation of the nail from its nailbed, result in a foul odor, and even cause pain. Dallas Podiatry Works is able to not only provide effective treatment to clear up a case of infected nails, but our foot specialists can also offer information on how to prevent an infection from developing in the first place. There are various treatment options for fungal nails, but you will probably want to ask our friendly staff about the benefits of laser therapy for this particular issue. 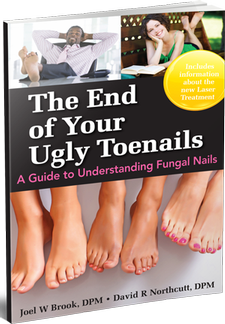 We don’t want you to be embarrassed and self-conscious about the state of your toenails, so order your free copy of our book The End of Your Ugly Toenails: A Guide to Understanding Fungal Nails by simply filling out the form found right here on this page. If you have any questions, give us a toll-free call at 972.566.7474 and we will be glad to help you. Order your copy today to start a fungal-free life!